Using the right project management tool can be the difference in your project’s success. The vast amount of software available that claims to do the same can make choosing the right tool an overwhelming task. A quick Google search tells you the most used programs, but that doesn’t mean that it is the right one for you and your team. Remember that not everyone has the same needs. Some businesses just need to-do lists, others need something that will analyze their data, while there are some that just need a simple way to invoice their clients. Of course there are teams that need every of those things and more. You have to know what you’re looking for. Unfortunately there’s not enough time (and sometimes not enough money) to try every project management software available and decide based on which one you actually liked. So, the question is simple: according to my business’s needs which is the best project management tool available? In this article we’ll be reviewing several project management tools and comparing them with each other. We hope that you’ll be able to make an informed decision regarding what’s best for you, whether you need something simple or a more sophisticated solution. But enough talking, let’s get down to it. 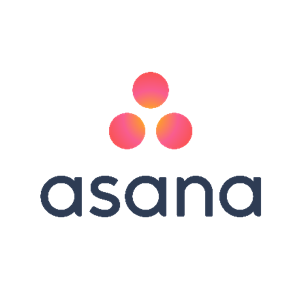 Available since 2011, Asana is one of the simplest management tools available in the game. Despite its simplicity, this project management tool is used by big-name clients, such as Dropbox or Pinterest. What it lacks in functionality, Asana makes up in its pricing — it’s one of the most affordable tools available. 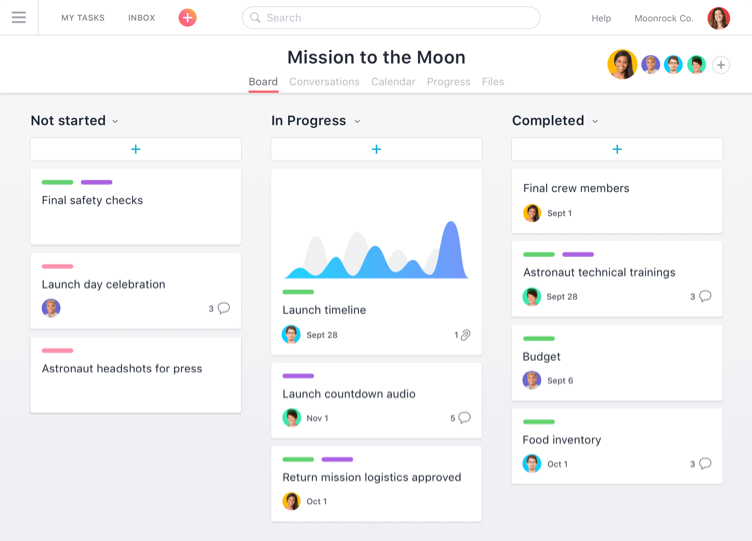 Although it’s better suited for smaller teams, Asana can help you divide huge projects into smaller tasks and plan your projects months into the future. Asana helps you streamline your projects and optimize your time, getting rid of those pesky morning meetings to discuss your project status. Emails and chats can all be done through Asana. Asana’s approach to project management is very simplistic. At its core it’s pretty much a complex to-do list creator. However, it manages to accomplish quite a lot with simple to-do lists. Everyone knows that lists are one of the best ways to organize everything and that’s why there’s practically no way around them. 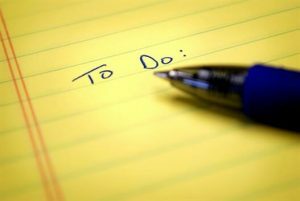 Almost every project management tool includes ways of creating to-do lists. None of them does it as good as Asana. Each to-do list you create with Asana works as an individual project. You can then create tasks within the list, as well as subtasks within each task. You can attach files to tasks and mark them with tags so you can search them easily at a later point. If you’re not a big fan of the traditional to-do list visual, Asana offers you the possibility to display the list on a Kanban board. Or you can even display your to-do tasks in a calendar view. However, some of those display modes can become a problem when you have a high number of team members working on the same project. Everything becomes cluttered and of difficult reading. That’s one of the reasons why Asana works best with smaller teams. There’s no need to download Asana. Being web-based, Asana works on your browser. If you need to constantly be updated on the go, Asana also offers free apps for both Android and iOS. If you can’t access the app, you can access Asana through your phone’s browser. Although not as complex as the desktop version, the mobile version lets you create tasks, attach files and check your inbox. 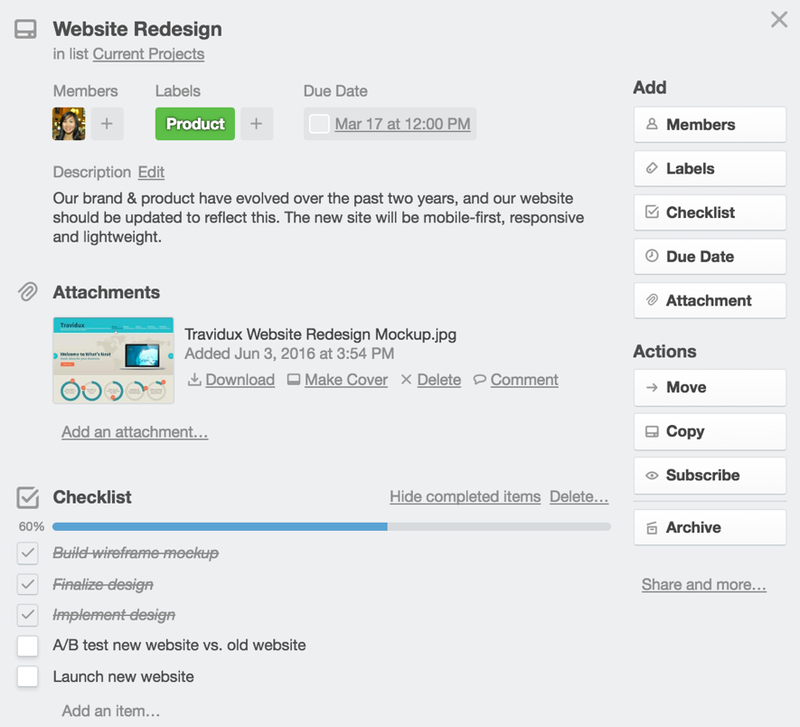 Asana’s design also makes it intuitive. Since it’s not a very complex tool, what you see is what you get. With Asana there will be no need to troll the internet looking for detailed how-to guides. 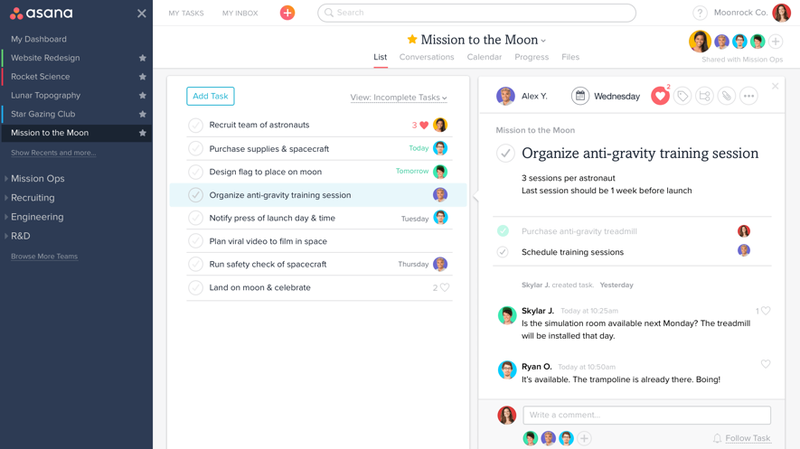 With it’s built-in progress tracker, Asana eliminates the need for project status meetings. You’ll always know how far ahead (or behind) you are on your project. With Asana you’ll also have several forum-like chatrooms, called “Conversations”. Each project will have its own Conversation, and each team will have their own Conversation as well. Conversations allow your team members to quickly send notes to one another or to post topics other team members can reply to. As you would expect from any business related app, Asana offers detailed user manuals that will help you getting started with Asana. The manual consists of video tutorials, frequently asked questions, user tips and extensive written guides. Whatever you can’t find in the user manuals, Asana’s dedicated team will help you with. Within 24 hours you’ll have an answer to your problems. Even though Asana’s not a very complex tool (that doesn’t mean it isn’t powerful), they will help you with any non-documented concern you might have. Its competitive pricing is without a doubt one of Asana’s biggest advantages. The premium version only costs $9.99 per user per month. If your team has less than 15 members, you can even use the free version. As you would expect, one of the drawbacks of the free version is its restricted functionality, however it can be enough if you’re new to the game and needing help with your smaller projects. There’s the possibility to try the premium version before you buy it. Free trials are always a plus. If you opt for an annual billing you can get two months for free. You can pay with any credit card, or, if your team has more than 50 members, you can send them an invoice. Asana also offers a Enterprise version, with even more in-depth functionality. The Enterprise version is priced on a case-by-case scenario, and you need to contact Asana in order to know how much it would cost you. Trello is also a straightforward project management tool, designed to help you and your team with your workflow. Due to its highly customizable (and simple) card-based interface, you can optimize it to have everything you need just a few clicks away. Although it functions relatively well with large, multi-personnel projects, there’s no doubt that Trello is better suited for small and medium businesses. Trello’s drag-and-drop feature makes it very intuitive. You can prioritize your team’s tasks just by dragging what’s more important to the top, or you can assign team members to a specific project by dragging their icon into the project’s. 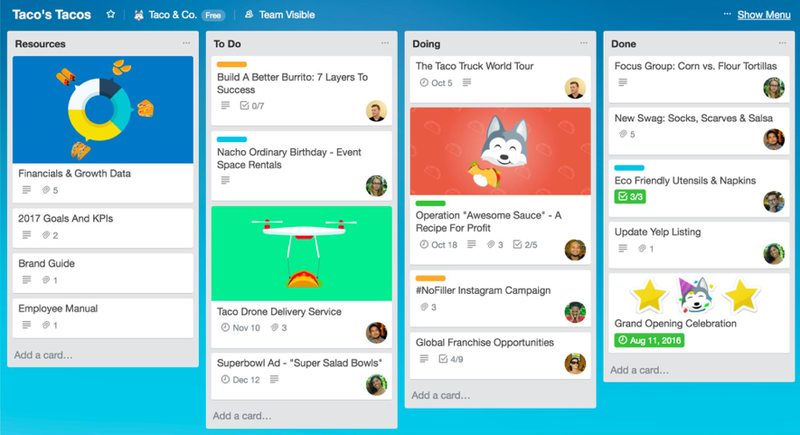 Trello is based around a heavily customizable Kanban board. Each board corresponds to a project, where specific team members can interact with it. Team members assigned to a project (or to a board) can move the cards (we’ll get to it) around the board, add members and attachments and create checklists. Boards are made up of lists like the ones you can see in the picture. Lists are usually used as divisions between the several stages of a project, but they can be used whichever way you see fit. You can create as many lists as you see fit for your project. There’s really no limit. At every price point, Trello comes with the ability to create unlimited boards, lists, and cards. But what exactly are cards? Cards are one of the most basic parts of Trello. They can be used as the actual tasks inside each list. As you prioritize certain tasks, Trello’s drag-and-drop feature allows you to push a particular task to the top or to the bottom of the list, as well as changing it to a completely different list. When it comes to complexity in the Trello ecosystem we have: Boards > Lists > Cards. But it doesn’t end there. Cards aren’t as basic as they look. As you can see, cards are a little bit more complex than they might seem at a first glance. Team members can add labels and attachments to cards, as well as assign due dates and other members. Although you can use cards as tasks, team members can also create checklists inside each card, giving the system a matryoshka-like complexity. If there’s something every project manager loves is when things work they way they should. Trello is super simple to learn and intuitive at every level due to its drag-and-drop feature. Want to add a team member to a particular board? Drag his icon into the desired board. Want to assign him to a card? You know what to do. Is the task complete and you want to move it to the “Complete” list? Just drag the card and drop it on the aforementioned list. There’s really not enough praise to be had by this simple, yet time-saving feature. 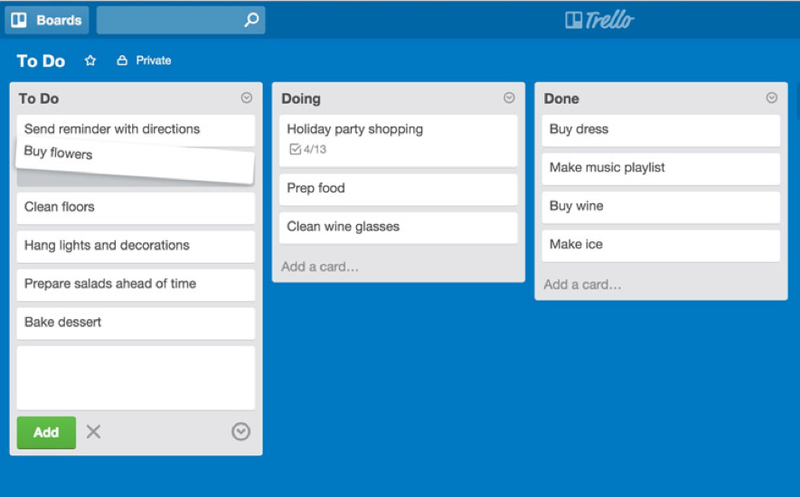 Trello is project management made simple. Everyone assigned to a board can see the same lists and the same cards, so confusion around the office becomes minimal. Everyone knows what they’re supposed to do. Flexible and smaller teams constantly being assigned to new projects will have their life way less complicated with Trello. It’s the ideal tool for businesses with projects based around different teams collaborations. There are hundreds of plugins for Trello. Plugins and integration-able apps are called “Power-Ups” in Trello’s language. If there’s a functionality you’re looking for but it isn’t natively supported, chances are there’s a power-up. for it. Jira is one of the most commonly utilized project management software among agile teams. 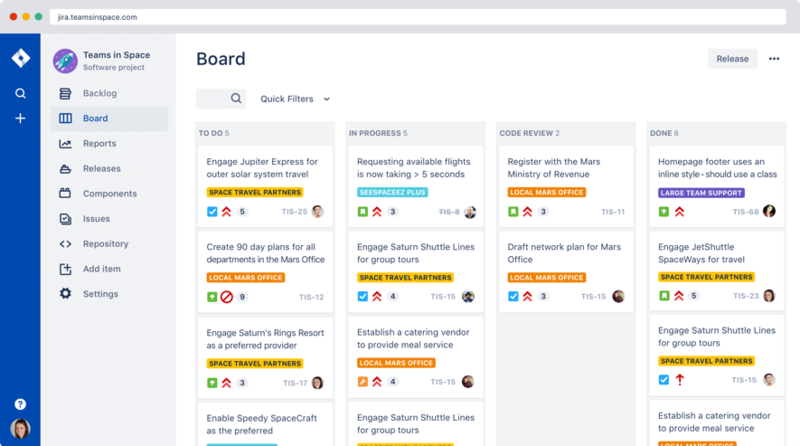 Besides offering Kanban workspaces, Jira also offers its users Scrum and Agile planning boards. Jira increases your team’s workflow by helping them plan their project, track their progress and squash bugs that might arise. 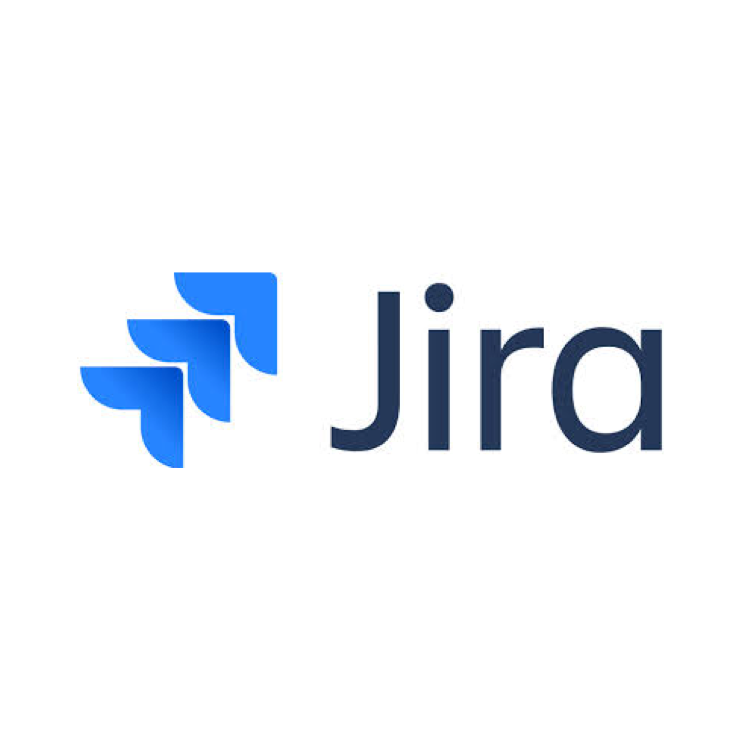 Jira is best suited for big software development teams and it makes software deployment and integration within your company easier. Jira doesn’t have a sleek and modern interface like some of its competitors. Although it is functional, It’s not as intuitive as other options on the market. There’s a steep learning-curve to this software due to all the things it offers, but when you finally understand it you’ll see that it’s a life saver. It can be overwhelming when you first look at the dashboard, but as you analyze it you can see that Jira offers things that other project management tools don’t, such as the ability to track sprints. Software teams can plan their sprints and constantly check their progress. All of the reporting tools available give your team valuable data regarding the progress of your project. Jira also works with a number of development tools that help you track changes to your code and to your builds, providing all of the necessary context. Jira lets you create multiple workspaces and within each workspace you can create multiple sprints, allowing you to constantly monitor them. You can know what is currently being done, what has been finished, and what still needs to be started. Jira’s dashboard offers users detailed reports of their projects. Things like burndown charts and time tracking are always just a few clicks away. It also lets work pass from one member to another without any manual input. Workflows can be automated and you can check their data with hundreds of their integrated apps. So your team can jump straight into it, Jira offers preset agile workflows that work straight out of the box. As you begin to understand the program you can start fine tuning your dashboard to optimize your workflow. Just remember that its target users are software developers. Jira also has a time tracking feature, allowing your team to keep track of time during sprints. Team members can easily monitor their due dates and the time they have left to finish a particular task. Issue tracking allows you to see everything that’s wrong with all of your projects at once. If you have issues in several different projects they will all appear in the same place. That way you can immediately know what’s wrong and needs to be fixed ASAP without having to jump back and forth through all of your projects. You can assign team members to each bug ticket and designate its priority level. Assigning each bug’s priority level is as easy as dragging and dropping what’s most important to the top. As the bug squashing progresses, team members receive notifications of changes made and are always kept up to date. 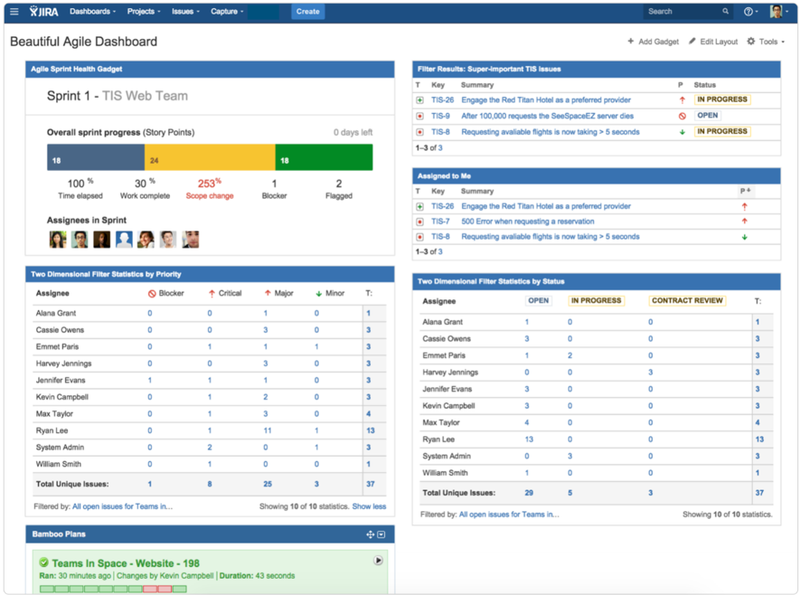 Jira’s Scrum boards help teams deliver on their projects through iterative and incremental steps. Tracking daily scrums and important milestones along the way are a given with Jira. Burn-down and up charts, as well as velocity charts and sprint reports are just some of the data that team members have access to straight away. There are several plugins you can install that give you access to even more detailed data that’s not available natively, such as Gantt charts. Despite being with agile teams in mind, Jira also lets users choose Kanban-type projects, so you’ll always have the project type that suits your needs. Jira has over 1.800 available plugins. If there’s something you’d like Jira to do, but there’s nothing that indicates that Jira’s capable of it in the documentation provided, chances are there will be a plugin for it. By browsing Atlassian’s website (Jira’s developers) you can look for that plugin that you desperately need. Easy Redmine is an open-source, Redmine-based, project management tool. Easy Redmine and Redmine are two different applications. 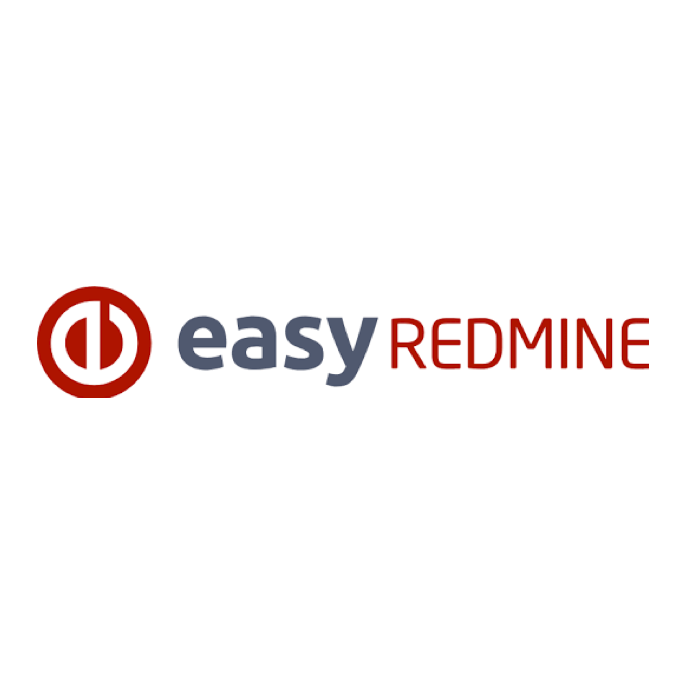 Easy Redmine can be seen as an upgraded version of Redmine. This upgraded version of Redmine adds extra features and has an increased functionality over the vanilla app. Easy Redmine overhauls the user interface and adds plenty of extra tools. 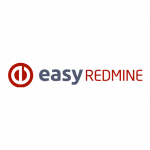 Easy Redmine is best recommended for teams with up to 100 members. Easy Redmine redesigns Redmine’s interface into a cleaner, more intuitive and functional one. Just by checking Redmine’s website you can see that they have don’t really care about their presentation, focusing instead on delivering a great product. Easy Redmine delivers an improved version of an already great product and turns it into something you actually don’t mind looking at. With the right packages, Easy Redmine allows you to do Agile projects or traditional ones and apply them to Kanban or Scrub boards, depending on your preferences. Easy Redmine becomes your one-stop for all of your management needs. This project management tool allows you to manage your budget, your resources and even your ideas. It also helps you managing your milestones and time spent on a particular project without the need of any extra plugins. Easy Redmine offers mobile apps for both iOS and Android operating systems. That way you’re able to keep updated on your projects wherever you are. Easy Redmine users also have access to their API and can choose to have a cloud-based solution or to host Easy Redmine on their own servers. Microsoft Project is probably one of the oldest project management tools available. Developed in the 1980’s, the fact that Microsoft Project is still widely used is nothing but a testament to its success. Even though there’s a large amount of project management tools available, MS Project is used by 67% of small businesses. That means that it does something right. Despite the fact that MS Project is not the best option for huge companies and larger teams, it manages to fulfill the needs of enterprise and small business owners, becoming a project management staple in the area. 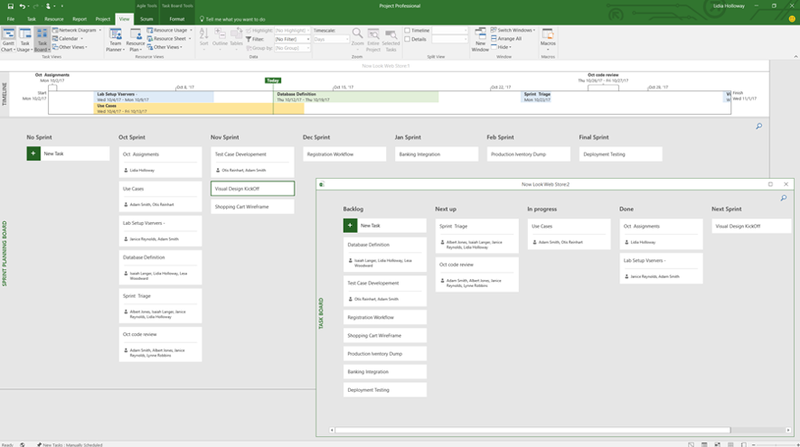 Microsoft Project shares its interface with the Microsoft Office suite. If you know your way around Excel and Microsoft Word, then you’ll probably quickly figure out MS Project. Although to be able to get the most out of it, you’ll probably need to read the provided documentation. There are no fancy buttons or beautiful displays in Microsoft Project. Everything is kept simple, but that doesn’t mean that it isn’t a powerful tool. Just think about Excel’s apparent simplicity and all the things that it is capable of. Besides being a project management tool, Microsoft Project can also help you manage your portfolios. Being fully integrated with Microsoft Power BI, you can get detailed reports and advanced analysis that will help you and your team to stay on track. Microsoft Project couldn’t have survived for so long if it weren’t constantly updated. Since 2017 it’s Agile compatible. You can display your projects in Kanban or Scrum boards, or you can do it the old-fashioned way. As is common with other Microsoft products, Microsoft Project offers a variety of built-in templates that you can use to quickly get started. You can create your own templates to use later, or you can download one that fits your needs from the internet. Microsoft Project gives you full visibility of every project you’re currently undertaking. 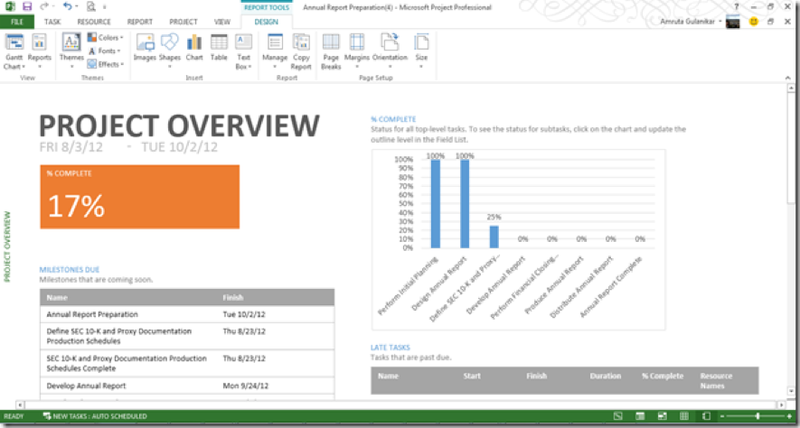 MS Project comes out-of-the-box with the various tools, such as Gantt chart creators and time tracking instruments. Its multiple timelines and milestone features allow you to actually measure your project’s progress across. Different timelines can be assigned to different data and you can share it with your project’s stakeholders. Obviously, Microsoft Project takes full advantage of Office 365, offering full integration with a plethora of Microsoft’s products and services. 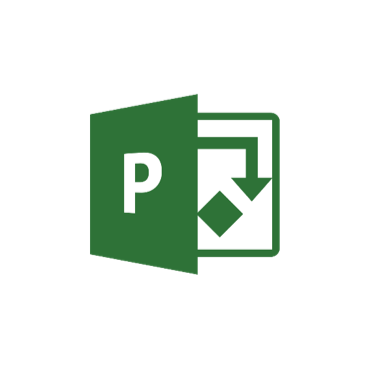 You can connect Microsoft Project to Skype for a better communication with your team members, or you can seamlessly export data into Word, Excel or PowerPoint. Microsoft Project also offers users phone apps so they’re constantly updated about their project status. If you’re looking to host MS Project on your servers, Standard will cost you $560.00, while Professional will cost $940.00. Basecamp makes collaborating between team members easy. 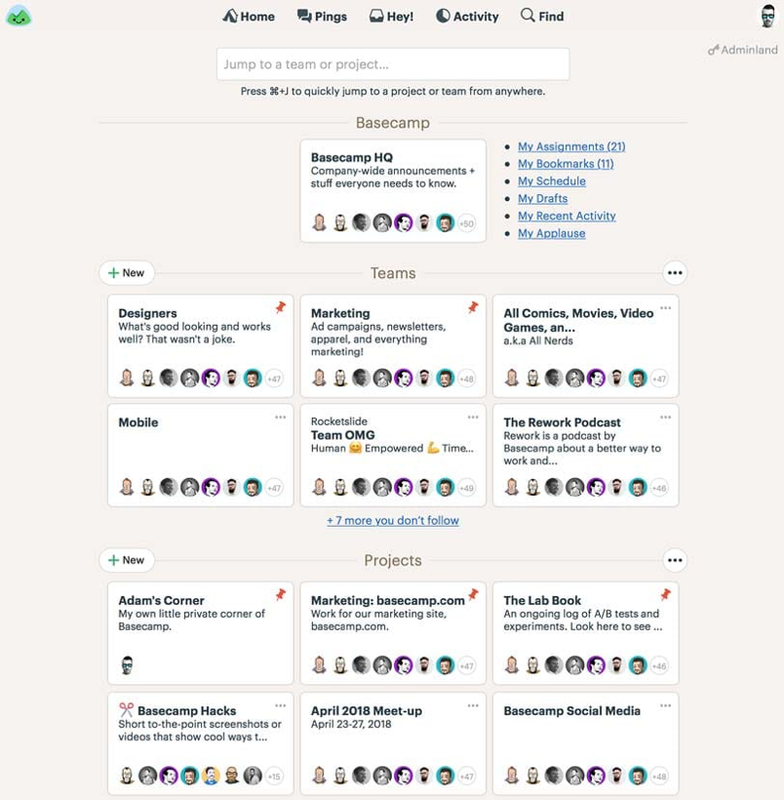 Featuring message boards, a native chat app as well as having file-sharing capabilities, Basecamp is one of the best project management tools if you require collaborations between several individuals. Basecamp tries to keep everything simple. It’s board-like display won’t overwhelm you and you’ll quickly figure everything out. Users can create their projects, as well as constantly update their progress and manage their tasks. Since it’s web based, you can use it any where — as long as you have an internet connection. With Basecamp you can have full visibility of every project your office is currently undertaking. Tasks are clear and easy to read, and you can prioritize whatever you see fit at the moment. Basecamp neatly organizes everything and quickly replaces the need for constant meetings. Basecamp features forum-like message boards, as well as a dedicated messaging client. With Basecamp you can also create your to-do lists and update your schedules, so you can always be prepared for what’s next. 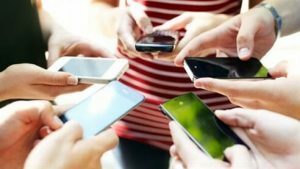 It’s file-sharing and storing capabilities will also prevent you from rummaging around the computer looking for that particular email that you can’t seem to find. Basecamp brags about being a substitute for 4-5 apps, such as: Slack, for the real-time chat; Asana Premium, for the to-do lists; Dropbox, for its file storing capabilities; and Google Suite, for Google Docs and calendar function. Basecamp can help you alleviate your headaches due to standard office proceedings, such as meetings and constant emails, but it can’t offer you much more. Basecamp is for simple tasks. There’s no Agile nor anything of the like. Basecamp is best suited for small businesses or non-profits where teamwork and collaboration is key. Even though Basecamp keeps simplicity to the max, it has dozens of integrations with third party tools. From mobile and desktop apps to time tracking, invoicing and accounting, these integrations will turn your standard Basecamp experience into something else entirely. If you’re a student or a teacher, Basecamp offers you their software for free — as long as you promise you won’t be using it for non-educational matters. They also offer discounts to non-profit organizations. Basecamp can seem pricy if you have a smaller team, or extremely cheap if you’re running an operation with dozens of individuals. 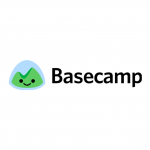 Basecamp costs $99 per month, regardless of the number of users you’re going to use. For $99 per month, you get unlimited users, unlimited projects and 500GB of file storage. Basecamp doesn’t distinguish between basic and premium users — every feature’s included. 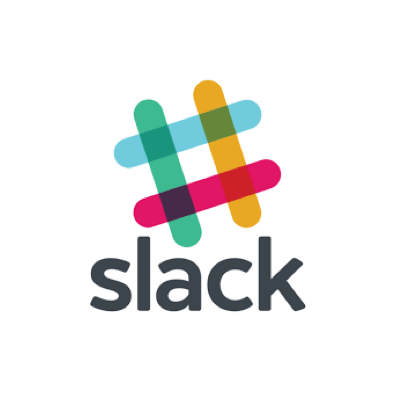 Slack is another project management tool based around collaboration. It provides a platform for teams to chat in, as well as to share files and the progress on the projects they’re working in. Slack is designed for companies that need real-time communication, but it is much more than a glorified chat client. Slack lets you store files and integrate other useful applications as well. Slack knows that some conversations aren’t meant for the whole team, so they’ve implemented a channel feature like the ones you’d find on mIRC or, more currently, on apps such as Discord. You can create channels for each team, for each project or for anything you want to. There’s no limit for the amount of channels you can create. You can share files within each specific channel as well. Your team members can join and leave channels whenever they see fit — there’s no need to stay in for the entire conversation. If you want to look up a past conversation, Slack lets you access each channel’s history. Even if you’ve already left the channel or archived it, Slack keeps track of your conversation history. 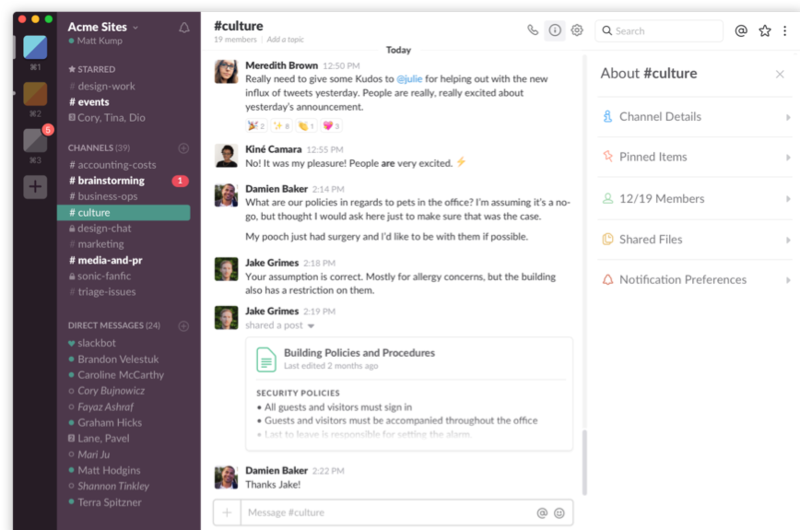 To go even further in avoiding boring meetings, Slack lets you voice or video chat. If you want to make sure work’s actually being done, Slack lets users share their screen. In order to increase Slack’s functionality you can integrate over 1.500 apps into your client. If you can’t find an app that does what you want it to, you can always build your own. Slack lets users access their API. 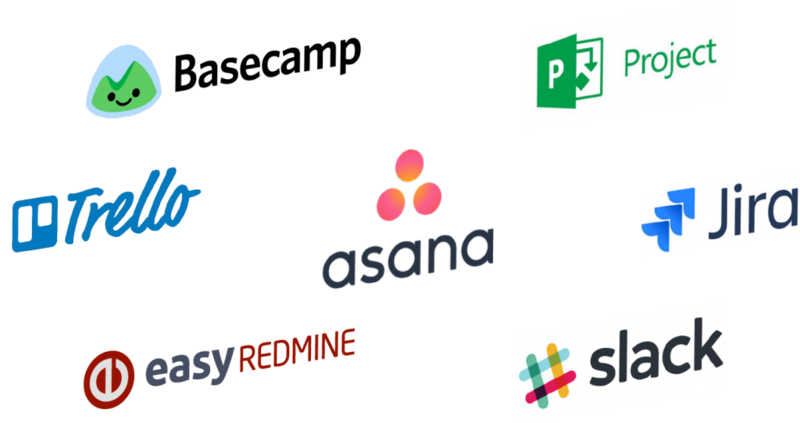 You can integrate into Slack apps such as Google Drive, Dropbox, Evernote, Asana, GitHub, Trello and plenty more. Now that you know about the specifics of the more commonly used project management tools you’ve probably made up your mind regarding which one is the best for you. If you haven’t, let’s look at what tool is best for what function. Keep in mind that there is no “best” tool. Each project management tool offers different strengths that might or might not be needed for your projects. If price is your main concern when choosing your project management tool there are a few options you can consider. 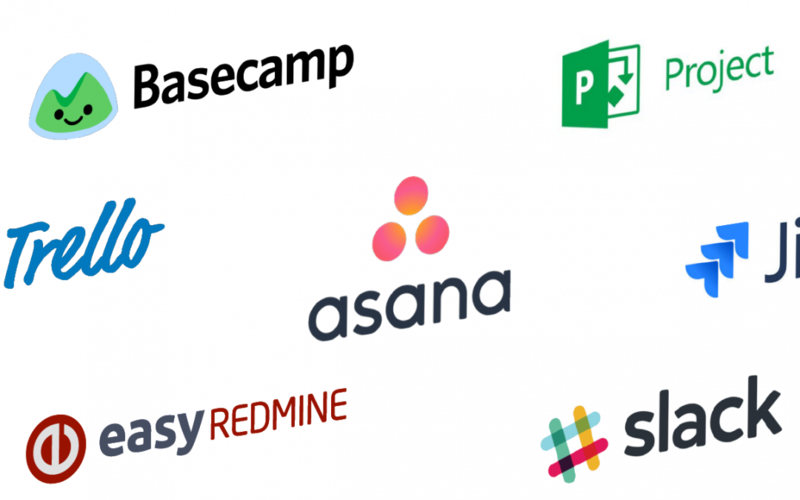 Asana, Trello, Basecamp and Slack offer you free non-trial options. If you qualify for it, Basecamp’s free version has no differences from paid ones. If you don’t qualify for Basecamp’s discounts then Asana and Trello both offer similar features. Slack may also be worth considering. You should consider trying them all, since it won’t cost you a dime. However, if you’re willing to spend some cash, but still want the cheapest option, then you should consider Slack ($6.67 per user/month), Microsoft Project ($7.00 per user/month), Easy Redmine ($29 per month for up to 25 users) and Jira ($10 for up to 10 users). You have to do the math to figure out how many users you’ll have and how much it would cost you. 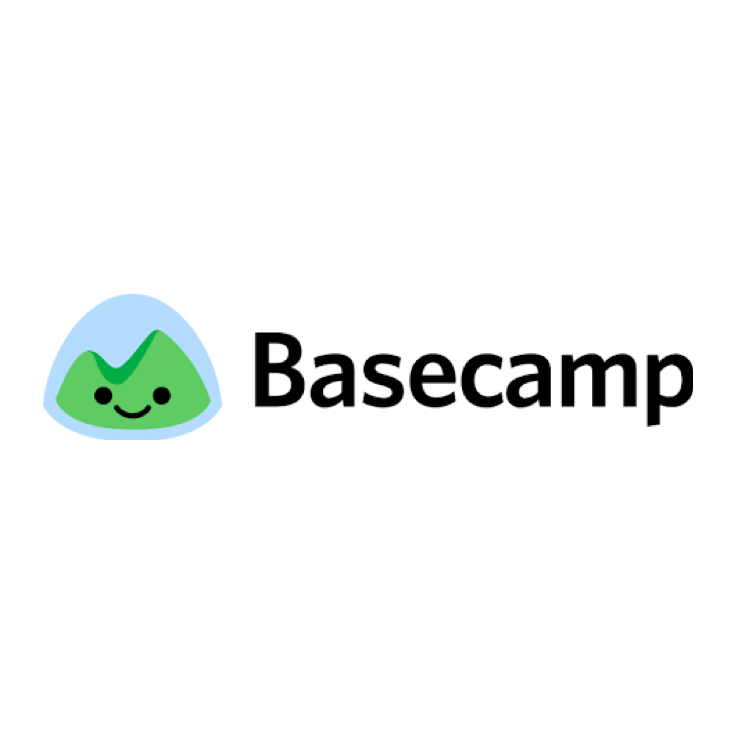 If you’re worried about how your team size will skyrocket costs, remember that Basecamp always costs $99 per month, regardless of how many users you’re going to have. If you want a project management tool which does a little bit of everything, which one should you consider? Due to the amount of plugins available and to the features already present out-of-the-box, Jira and Easy Redmine are the obvious choices. Microsoft Project can be worth considering as well, but it’s not as deep as Jira or Easy Redmine. If you’re looking for a tool which will provide you different types of functionalities then you shouldn’t consider Slack or Basecamp. If you’re projects are heavily reliant on teamwork and constant feedback, then the clear winner is Basecamp, closely followed by Asana and Trello. Slack can be considered as well, but Basecamp does everything Slack does and in a better way. 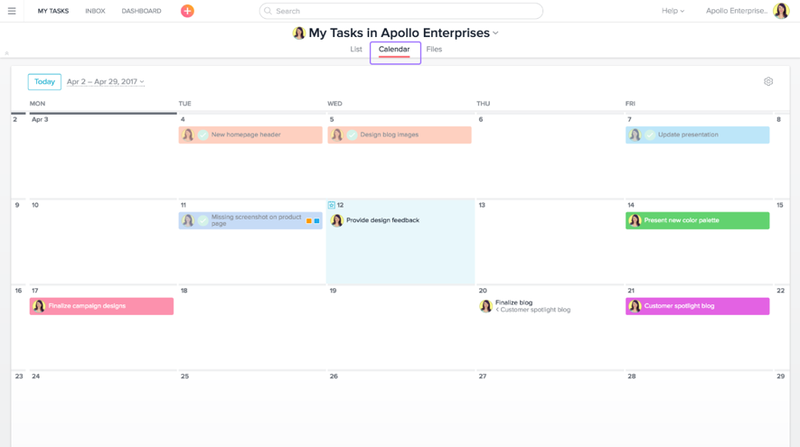 If what you really need is a to-do list creator, with the options to change your priorities and to know what’s being worked on, then Asana is probably your best bet. 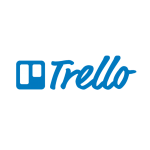 Trello might be worth considering as well. 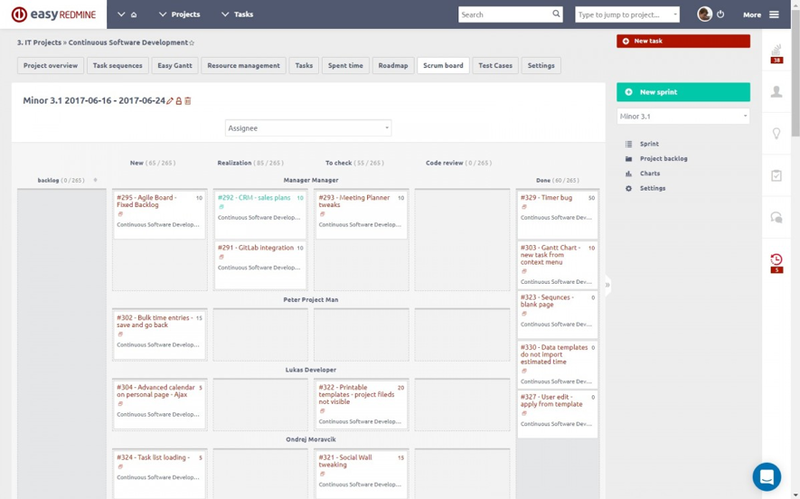 Kanban boards will help you increase your workflow, and Asana and Trello are the best at it. The answer is Jira again. Its bug squashing capabilities as well as the fact that it plays great with enormous teams makes it the perfect tool for big offices focused on software development. Jira lets you test and quickly deploy your builds without a hassle. Let’s look comparatively at each software’s features. Remember that most unavailable features can be added to almost any software through the use of plugins. 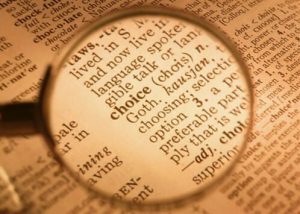 Even after reading several comparisons we know that the choice can be overwhelming. It’s okay to change the program you use if you find out that the one you thought was best for you actually wasn’t. At the end of the day you can read about what seems to be the perfect tool just to find out that you don’t actually enjoy working with it. The only sure way to know which tool is best for you is to pick the one that seems more appropriate and to try it out. If you find out you don’t like it, use the one that looked like the second best. Don’t forget that you have to use each tool for a while so you actually get a feel for them and unlock all of their possibilities. Which project management tool did you decide to go with? We hope we managed to help you decide what’s the best project management tool for you and your team. Let us know in the comments below. No program, app or software suite can win big, if confident, loyal consumers do not adopt it. There’s no getting around that. While there are myriad elements in building quality software (from functionality to advanced features not available with the competition), the most important thing is the user interface. If the interface is clumsy, overly complicated or just downright ugly, you can expect consumers to run away rather than embrace your new offering. You get around this massive issue by following industry-best user interface rules. Of course, if it were that simple, then everyone would be a hit designer, and obviously, that’s not happening. You first need to understand what user interface rules you must follow, and then implement them into your projects. We’ll take a look at the most important rules below. 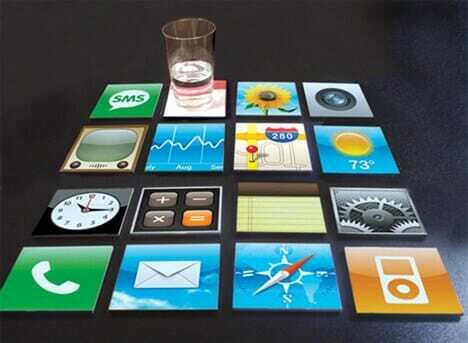 The user interface is arguably one of the most important elements of any program or app. It’s all in the name – the UI is the surface through which software users interact with the software. Without a good UI, your software is dead in the water. That’s blunt, but true. No matter how robust your software, no matter how advanced its capabilities and regardless of its price point, without a good user interface, you’re staring failure in the face. One excellent example of how this affects the real world can be drawn from the Iran-Iraq War back in 1988. Because of a poorly designed user interface (read: horribly complicated and unintuitive), a US warship shot down a civilian aircraft. Let’s get something out there first – the specific type of software you’re developing will have an effect on the user interface rules you follow. For instance, designing software for use on the desktop is very different from designing a mobile app. Each environment has different rules that must be followed; however, that doesn’t mean there aren’t all-encompassing rules that apply to all types of software, and those are what we’re going to discuss here. User in Control – Perhaps the most important of all user interface rules is that you need to make your users feel like they’re the ones in charge. They’re the ones in the driver’s seat. Automation is great for certain tasks, but most users don’t want to feel like the software is in charge. An excellent example of adding user control is allowing customization of the user interface. Direct user object manipulation is also an important control element to institute, as is providing navigable paths through various functions and features. Design your user interface to ensure that your user is the one with the power and control, not the other way around. Think of it this way. Are you more comfortable in an airplane, where you don’t know the pilot, or have the ability to do something if things go wrong, or as the driver of your family car? Design the UI so your users are the drivers. Consistency at All Times – Another important rule for UI design is consistency. You cannot afford the repercussions of inconsistent design. This goes beyond the GUI design, and as deep as using the same (or similar) menu commands in different situations. Consistency across your user interface is vital. All elements of your user interface must be consistent across the board. Inconsistency will lead to a disjointed user experience, which can kill even the best software. You should also build in consistency with related products. Microsoft’s Office suite is a perfect example of this, although Adobe’s CS suite is also a good example of user interface rules applied perfectly. Give your users a consistent, familiar experience throughout your program or app, and in all related programs. Multiple User Skill Levels – When it comes to user interface rules, including adaptations for multiple user skill levels is an incredibly important consideration. Look at it this way. A user fires up your program for the first time. They’re not sure what’s what, where to go or how to get there. They’re novices. You need to take that into account, and create a system that can guide novice users where they need to go. However, over time, that user develops familiarity with, and then expertise in the software and they require less and less interaction. In fact, they DEMAND less interaction. They transition from someone who needs their hand held to someone who wants to complete a function immediately, with as little interaction with the software as necessary. To do that, you need a system that features shortcuts, intuitive commands and more. Easy Action Reversal – We’ve all been there before. We’ve all done something on a computer and said, “Whoops! That’s wrong!”. The difference lies in how those erroneous actions are handled, and in how you allow users to correct their mistakes. User interface rules dictate that your UI needs to provide a simple, effective, intuitive method to reverse mistakes. Microsoft Word’s “undo” feature is a perfect example here. A single button click is all that’s needed to reverse the error and revert the document back to its pre-error state. Windows’ recycle bin is another example. If a user erroneously deletes a file, it can be restored by going into the recycle bin, selecting the file or folder and then clicking “restore”. Essentially, it’s a failsafe that protects users from their own mistakes. Build this functionality into your system from day one. Limit Memorization – Expert users know where they want to go in a program, or what they want to accomplish. Many have memorized keyboard shortcuts or macros that allow them to complete complex tasks with a few keystrokes. However, you can’t expect all users to attain that level of expertise, or even to want that level of knowledge. Good user interface rules dictate that you design your software to limit the amount of memorization necessary to achieve a specific goal. Error Handling – There will be errors with your software. There’s no getting around this. No matter how much beta testing you do, no matter how many hours of debugging go into the program, there will be errors with end users. Build for this now, from the very beginning. User interface rules dictate that any UI should provide a simple, intuitive way to handle errors. More – design your system so that it’s difficult (or impossible) for a user to make a serious mistake. Once an error occurs (usually due to user problems), the system must provide simple, actionable steps to rectify the situation. Complex error handling only leads to frustration and dissatisfaction with the software. 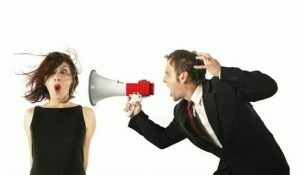 Provide Feedback – Every action taken by a user should have immediate, visible, unmistakable feedback. Your users need to know that the commands they sent had the desired result. Let’s look at word processing software. The most obvious feedback here is that when a user types a letter, it appears within the document. Letters add up to words, and words add up to sentences, then paragraphs and eventually entire reams of information, all built through user feedback. Whatever function the user is performing, it needs to provide immediate feedback that can’t be mistaken for something else. Make sure that your users know the commands they’re sending are getting through. Navigable – One of the greatest holdbacks for explorers during the Age of Exploration was a lack of navigability. Waterways weren’t charted, hidden rocks, reefs and low-lying islands ripped the hulls out of ships, and figuring out where you were going was hard. Don’t do that to your users – follow industry-best user interface rules and design your system for simple, intuitive navigation. We can draw an example from the world of web design here. When you land on a website, how likely are you to stick around if you can’t find the page that you want, or easily navigate to another page of interest? You’re not going to stay long. The same principle applies to your software. Make your program easily navigated, with intuitive controls, menus and systems that make sense to your USER. Language Concerns – Use interface rules state that if a UI doesn’t use relatable, understandable language, users will fail to engage with it, and the program will ultimately fail. Build your system on language that relates directly to your users and their experiences. If a commonly understood term can replace a technical-sounding one, do it. The easier it is for users to understand the commands and navigation structure, the more they’ll use it, and the more familiar they’ll become with the program. Following these user interface rules ensures that your UI is accessible, easily navigated and intuitive. Creating an ideal UI encourages user adoption, enhances ROI and increases the likelihood of a successful software launch and lifespan. Whether you’re designing the next hit desktop program or a new mobile app, user interface design is of paramount importance. Whether we like it or not but we all live in the world, where everything is required to be done as quickly as possible with no loss of quality. And the business of software development is not an exception. Many companies unable to meet deadlines with the help of the staff they have or just looking for cheaper labour force decide on the strategy of outsourcing. Outsourcing tends to be a perfect solution for many cases, it helps to reduce both overheads and costs, but one should always keep in mind that this way has some of pitfalls, which can lead to the crash of the whole plan. But there are no reasons to worry, the majority of them is quite easy to escape. We have gathered for you 5 most common mistakes software developers make in outsourcing and have described how to avoid them. 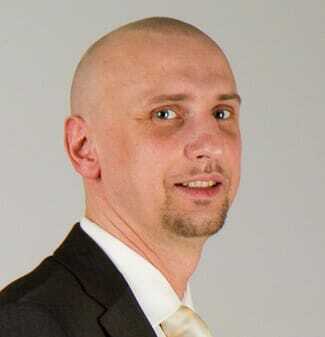 One of the main mistakes in outsourcing is setting the saving of budget as a main priority. Of course one can expect to spend less money when hiring people on the side, but you should always keep in mind that you get exactly what you’ve paid for. If a developer asks for fulfilment of a task twice as little as the normal cost is, there should probably be some reasons for that. So if you are not fond of writing tons of corrections, you’d better stay away from such low-price specialists. It doesn’t take a genius to understand that not all positions are equally good for outsourcing. Moreover delegating some tasks to a person out of the company is always a risk. So you’d better start with small tasks, which would be easy to fix in case of failure and which don’t depend much on professional knowledge and experience. If you are satisfied with the outsourcer’s performance on such tasks you can step by step switch to bigger tasks requiring more responsibility. But still don’t forget about regular control and at least weekly reports, otherwise one would end with tons of undone or badly done work just before the deadline. If you are hiring a few outsourcers, it’s also advisable to think about the hierarchy among them so as to make the control easier. And of course try describe the task as detailed as possible to avoid misunderstanding. Outsourcers are often thought of as additional workers, which are not expected to show any initiative. That type of thinking actually deprives you of some brilliant ideas an outsourcer may come up to. Just let him feel being an important part of the team and give the chance to take the leading part in fulfilling the task. If you are going to hire this outsourcer again, give him some room to grow, this would do a lot of good both for you and for him. With this change of attitude you will turn a simple worker who is good only for execution of the tasks set into a devoted employer, who cares about the future of a company. 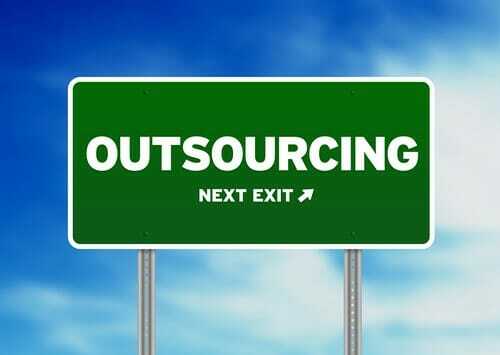 Many companies see in outsourcing a magic key to success. It really can be very beneficial, but the company should be prepared for this type of business. It is of high importance to plan outsourcing strategy wisely and take into consideration the amount of work, size of the team and many other details including the plan of future development of the company. 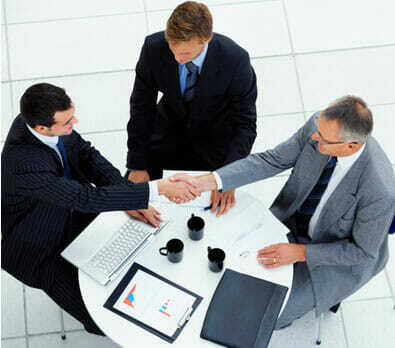 Only having recognized all those things one can understand the number and type of outsources which the company needs. One should devote some time to training current employees to cooperate with new executives, no matter whether it is a long-term or a short-term project. We hope these tips will help you to avoid common mistakes in outsourcing, make your work more beneficial and get most of your IT budget.